Any screw thread is a form of helix. It might be possible to use this configuration to cut fine threads. But this is probably easier to do on the lathe. 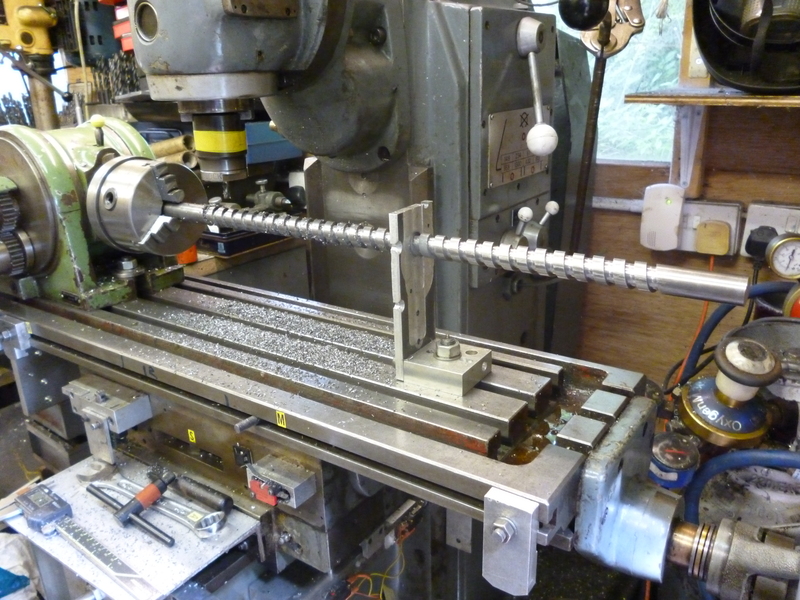 However the lathe is usually used to cut threads where the helix angle is very close to 90°. 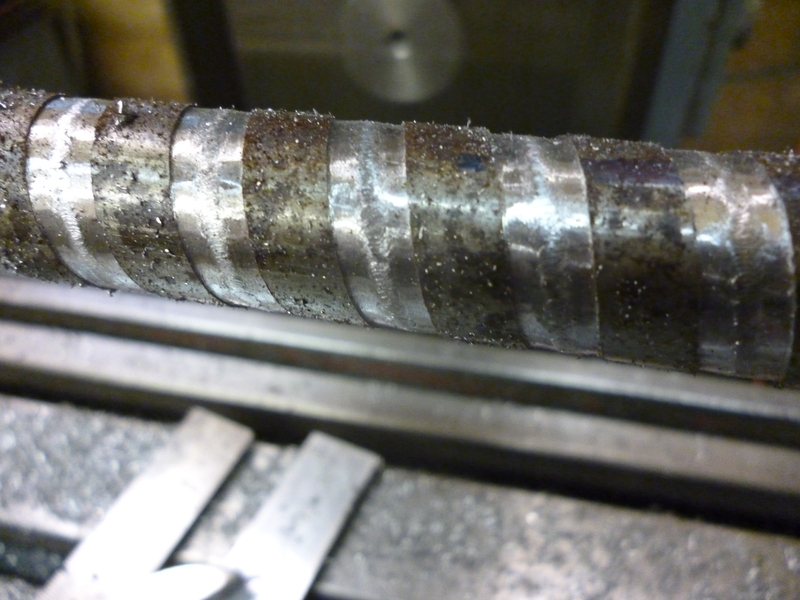 As the helix angle gets smaller it becomes difficult to cut threads like this on a lathe. Ideally a thread could be cut using a tool rather like an endmill but with the profile required for the thread. These do not seem to exist. 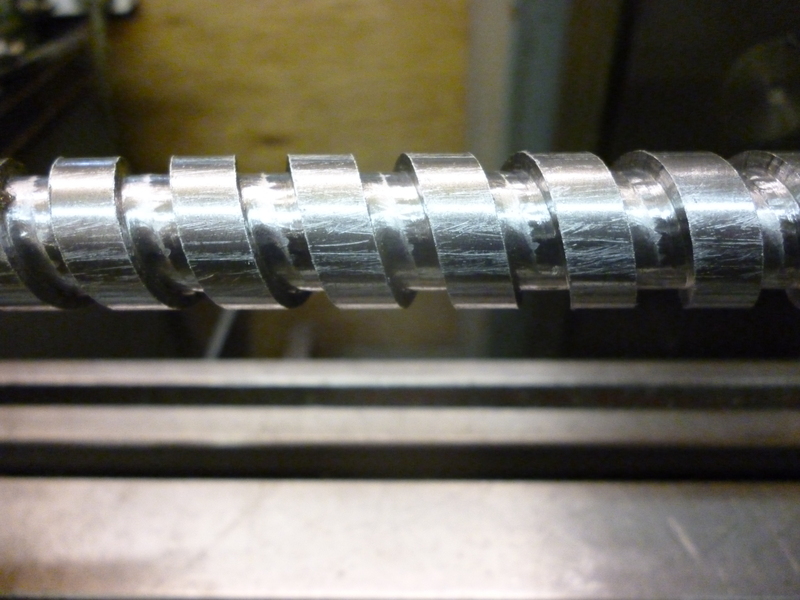 An endmill or slot drill can cut a square groove in the form of a helix on a round surface. The problem with this is that the traditional endmill has a hole in the end of it which does not cut. The cutting edges only cut the sides of the bottom of the groove. Furthermore, they only cut when these edges are at the highest point on the workpiece i.e. a line along the axis of the thread. It is not obvious that anything is actually cutting the middle of the bottom of the groove. If a slot drill is used a much bigger part is actually cut. This can be seen in the following figure. This thread was required to replace a screw mechanism for opening a window in a Victorian greenhouse. However the length of the thread required was about twice the available movement along the x axis. The pitch of the thread was about 14mm. The outside diameter was 19mm (ie ¾ inch). The depth of cut was about 2.5mm. The only way of getting the right pitch was to connect the leadscrew directly to the drive shaft of the dividing head. 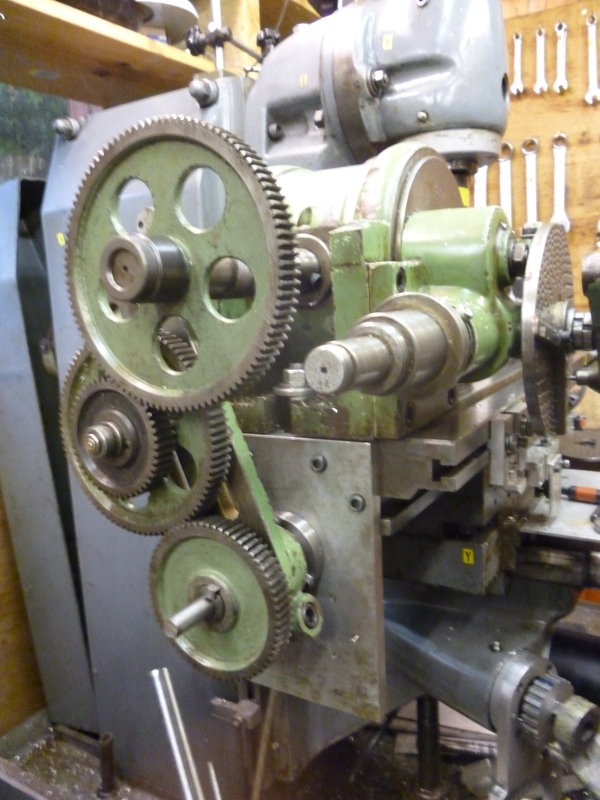 A workpiece of the required length was fitted into the chuck on the dividing head. The middle was supported with a specially made steady. The first half was cut. When the first half had been cut the workpiece was turned round. The start of the second cut can only be synchronised by adjusting the position of the thread in the chuck. But this has to be done with the end of the previous cut moving away to the right in order to get rid of the backlash in the system. Another particular thread where this is possible is the Acme thread. The tread has a flat bottom which can be machined with a slot drill in the vertical position. It has flat sides that can then be machined with an endmill that is tilted to the appropriate angle. These threads are commonly used for leadscrews on pre-cnc machine tools. With a thread the key feature is the pitch. In a milling context this is the lead of the helix. The pitch of a thread is the pitch regardless of the diameter of the workpiece. For a large thread the pitch of the thread is of the same order as the pitch of the leadscrew of the milling table. That would mean one turn of the leadscrew to one turn of the workpiece. But if the leadscrew drives the auxiliary input there is a built in divide of 40:1. The way to get round this is to drive the shaft of the dividing head directly. Even so there still needs to be a gear train to give the required ratio. The solution is to drive the leadscrew from the shaft of the dividing head. All of this is then driven by turning the handle on dividing head. This works because the bottom of the thread is flat. This can be cut with an endmill. Then the sides can be cut with the same endmill but with the vertical head tilted. Notice that when milling one of the flanks the cutter is milling uphill but when milling the other flank it is milling downhill. In the fig. the cutting is downhill milling. So long as the amount being cut is small enough this will work. In this case the workpiece is moving from left to right. To mill uphill for the right flank would need for the workpiece to rotate backwards and to move from right to left with the cutter tilted to the left. To mill the left flank uphill would need the workpiece rotating forwards and moving from left to right. That is a truely enormouse size. 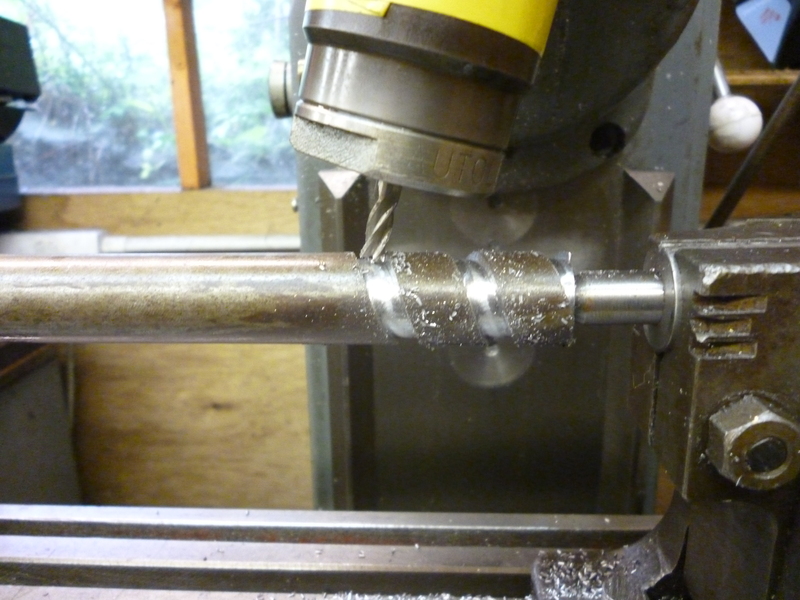 It would be impossible on a small lathe but might be possible on a milling machine. It might be worth thinking about what you are trying to do and seeing if there is not some other way of doing it.